Last month, Mayor DeWayne Hopkins and his wife Jill spent ten days in China to attend the opening of the Muscatine Center and renew old friendships. This was Hopkins’ second trip to China as a representative of Muscatine. The first trip to China in November 2012 served to set the stage for the sister city relationship between Muscatine and Zhengding County. Hopkins described landing in China on this trip as different than his first. In 2012, he and the group from Muscatine landed in Beijing as a light snow dusted the ground. This time, they flew into Shanghai where they were forced to embrace the summer heat. The first night in Shanghai consisted of dinner at a restaurant in the Bund area with a view across the Yangtze River. After dinner, Mayor and Jill Hopkins, Daniel Wang and Glad Cheng of China Window LLC and Albert Liu of Musco Lighting took a walk along the river. Daniel and Glad explained the history of some colonial buildings in the area. Hopkins said that the Bund area was full of sightseers who were out enjoying the view of the city lights and the iconic Oriental Pearl TV Tower. Early the next morning, they took a bullet train to Hangzhou. In Hangzhou, Hopkins had a familiar welcome after being greeted and led into a building containing pools to raise goldfish. The moment he entered the room where they would meet with representatives in Hangzhou, Hopkins knew he had been in that room before. He joyfully described the 3-D mural that covered the wall. 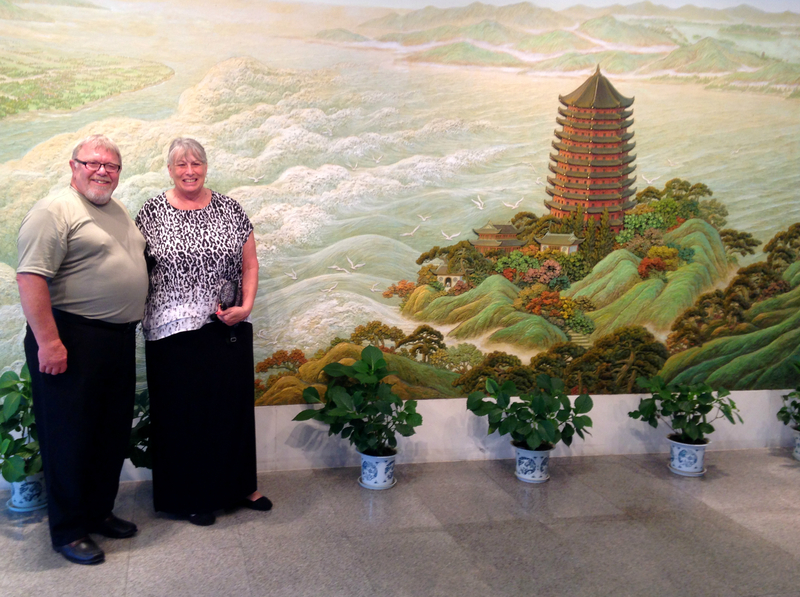 The mural included imagery of traditional Chinese architecture as well as natural landscapes. The next stop was Glad’s hometown, Kaihua. There, the group visited with Glad’s family and toured local sites, including a root carving museum. 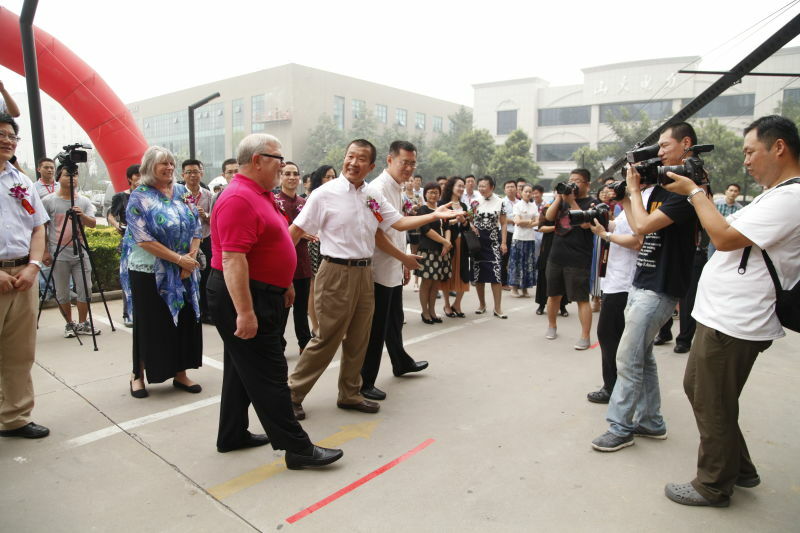 After touring various cities throughout China, Hopkins and the group made their way to Jinan on July 17 for the opening of the Muscatine Center, where Hopkins serves on the Board of Directors. The center features photos of Muscatine from the past and present, big screens with videos of key players in the Muscatine-China relationship and information about Muscatine businesses. There is a clear theme present that highlights China’s President Xi Jin Ping’s relationship with the City of Muscatine. An impressive feature of the center is a 300 square foot table model of Muscatine. Hopkins described the opening of the center as a time of celebration. He and Jill were joined at the center by Muscatine High School students Marci Clark, Grant Nollette, Zoey Petersen and Alexa Santaniello, Davenport Central student Kay Axel, and their chaperone, MHS teacher Angie Curtis. 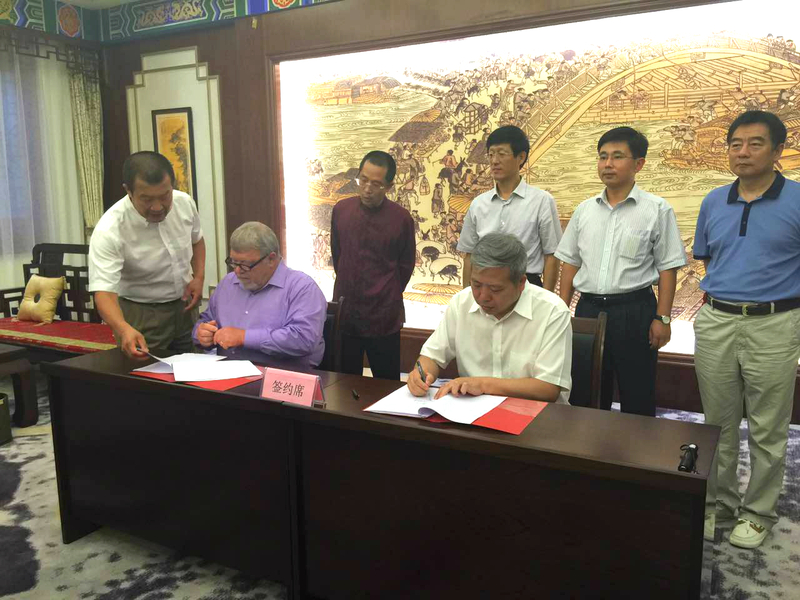 Prior to the big event, Hopkins and Mr. Li of the Confucius Foundation signed an agreement to begin a communications process to move forward with a business and friendship relationship between Muscatine and Jinan. 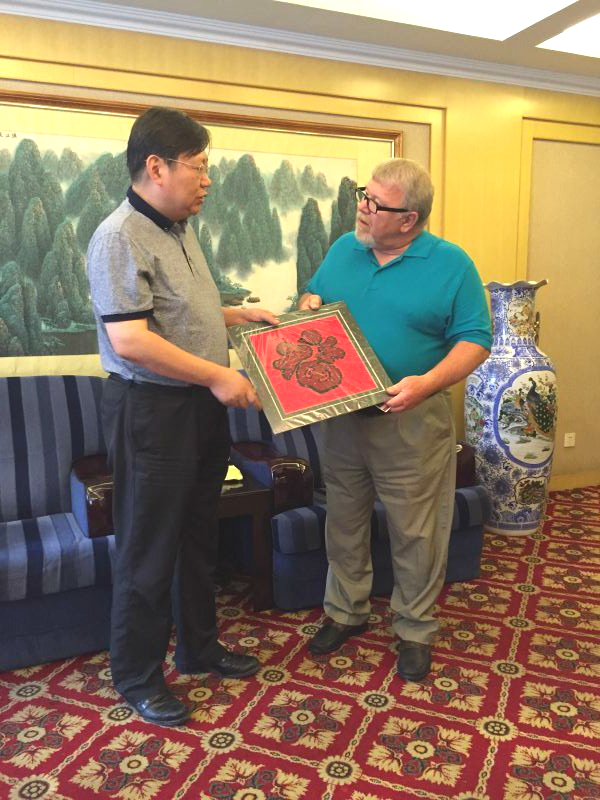 During his visit to China, Hopkins was eager to reconnect with old friends in Muscatine’s sister city Zhengding County. He had the chance to meet with Zhengding’s Mayor Yang, who was serving his final days in office before being promoted to a higher position. Hopkins and his group had a full schedule during their time in China. They visited eight cities in just seven days. “Everywhere we went was an extremely rewarding experience,” Hopkins said.